Every year, we offer classes to students of all ages and abilities in our community. Our young art students benefit from the same passion for art education that we provide our adult students. 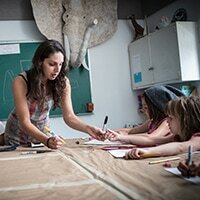 Valley Art Center's large, updated facilities include five classrooms fully equipped for learning pottery, painting, jewelry, sculpture and other fine art and craft media. Over 1,000 square feet of gallery space offers ongoing learning opportunities based on observing art objects on display. And once a year, VAC students of all ages exhibit together with faculty in the Annual Student/Faculty Exhibit.